How many times does Channing Tatum accidentally get neuralized? The Sony Pictures hack we reported on is the gift that keeps on giving (horrible as it may be). Along with learning of Marvel's attempts to get Spider-Man in for a cross-studio collaboration, we now know that Sony is combining two of its other well-known franchises. According to emails from Sony Pictures Entertainment Chairwoman Amy Pascal, the studio is going to crossover Men in Black, and the Jump Street duo (Jonah Hill and Channing Tatum). The film would effectively be 23 Jump Street (my title, not theirs), with the Men in Black characters making an appearance in their universe. Unfortunately (or fortunately, depending on your point of view), the project doesn't appear to include Will Smith or Tommy Lee Jones, at least in any significant role. Hill and Tatum would return, however, as would director duo Phil Lord and Chris Miller (confirmed to produce, but not yet to direct). Stephen Spielberg has been asked to executive produce (as he did on previous Men in Black films), but that's not yet set in stone. Along with being entertaining (either outright, or in a train wreck sort of way), the crossover could also breathe new life into the stagnant Men in Black franchise. 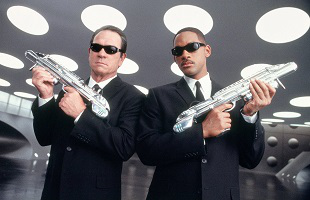 Despite Men in Black 3 grossing over $650 million worldwide in 2012, the film didn't make a profit (thanks to a bloated marketing budget, no doubt). A successful team-up with Jump Street could call for an MiB reboot down the road. The crossover would hit theaters in 2016 or 2017, so more details are sure to come over the next 12 months.